Cyrus was born on 1 July 1836. He enlisted as a Sergeant from Wheybridge, Vermont on 1 September 1862 in Company D, 1st Vermont Heavy Artillary Regiment. He was promoted to full Quartermaster Sergeant on 2 May 1864. He was promoted to 1st Lieutenant on 4 June 1864 and to 2nd Lieutenant on 8 January 1865. He was wounded and mustered out on 7 June 1865. In the 1890 Veterans Schedule he is living in Moorhead. His wife, Angeline S., started receiving a widow's pension on 23 January 1901. Cyrus died on 12 November 1900 and is buried in Riverview Cemetery, Marseilles, LaSalle County, Illinois. Burial, Tombstone Picture. George was born 5 September 1842. He enlisted as a Private on 6 April 1865 in Company H, 1st Minnesota Infantry. He was promoted to Full Sergeant. George was mustered out on 14 July 1865. In 1890 he is living in Moorhead. He started receiving his pension on 6 July 1891 in Minnesota. He died on 15 October 1915. He is buried in Sheridan Masonic Cemetery, Sheridan, Yamhill County, Oregon. Burial, Tombstone Picture. Taken from The Compendium of History and Biography of Northern Minnesota: "Levi Thortvedt, residing on the old homestead farm in Moland township, is one of the early settlers of Clay county and was born in Norway, January 31, 1860, and was the third child and only son in a family of four children born to Ole G. and Thona (Saangdal) Thortvedt. The father is perhaps better known as Ole Gunderson, he having changed his name in recent years [Note: In the 1880 Census Ole was using Thortvedt]. The family came to America in 1861 and located in Huston county, Minnesota. In the spring of 1870 they started overland for Ottertail county, Minnesota. At Alexandria, Minnesota they met Ole Strandvold and went with him to his home in North Dakota across the river from Georgetown. The location in North Dakota was not all that they desired, and the father started back for Ottertail county, their original destination. Enroute they met R. M. Probstfield, who offered to pilot them to Buffalo river. They located there, and the family is known as one of the three pioneer families of Moland township. On the west bank of the Buffalo river a small log house, with elm bark roof, was erected, and this served as their home for many years. The father of our subject put worth earnest efforts to develop his farm and induce others to settle in the country, and to his influence may he attributed much of the prosperity enjoyed in that locality to-day. Three families came together and passed through many struggles before gaining a permanent foothold. The crops of 1871 and 1872 were destroyed by grasshoppers and the family depended upon the money obtained by breaking land and what they could make from their stock to support themselves during the first few years. Levi Thortvedt has remained on the old homestead and is engaged in diversified farming and does threshing. Mr. Thortvedt was married in 1884 to Miss Ingeborg Midgaarden. To Mr. and Mrs. Thortvedt nine children have been born. Mr. Thortvedt is a member of the Norwegian Lutheran church and of the M. B. A. Politically he is a Populist." Levi and Ingeborg were the parents of 10 children: Ole, Goodwin, Elfa, Dora, Stella, Adele, Orabel, Eva, Florence and Norman. The above indicates that Levi's father was Ole G. and at one time was known as Gunderson. His tombstone indicates "Olav". Levi and his wife Ingeborg and his parents Olav and Thone, and many other Thortvedt family are buried in Concordia Lutheran Church Cemetery in Glyndon. Jonathan was born in Vermont, about 1840. In 1885 he was living in Hawley. On 2 December 1863 he enlisted as a Private from Guilford, Minnesota. He mustered in Company M, Minnesota 2nd Cavalry Regiment on 28 Dec 1863 and mustered out on 04 December 1865. Some records have him in 1st Minnesota Cavalry. His pension record of 7 April of 1880 has him in Wisconsin 2nd Cavalry. Most records have a Jonathan Tisdale living in Wabasha County. Charles was born 26 July 1843. His tombstone memorial has him born in Canada; some records have him born in the United States. He enlisted as a private on 1 October 1864 in Company Battery G, Illinois 2nd Light Artillery Battery. He was discharged on 4 September 1865. He was married in Clay County to Anna B. Deming on 4 May 1875. He was appointed the Postmaster of Glyndon on 28 February 1888. He started drawing his pension on 8 May 1901, filed in Minnesota. On 22 October 1908 another pension was filed in his name. It was filed in Canada by Mary A. Smith, as widow. His family in the 1880, 1890, and 1900 census reports is living in Glyndon. Charles died 26 July 1908 in Canada. The following was published in the Compendium of History and Brography of Northern Minnesota, Published in 1902. Foremost among the business men of Clay county and one of the most widely known merchants and highly esteemed citizens is Charles G. Tracy, of Glyndon, whose fine portrait adorns one of the pages of this work. Mr. Tracy was born in the province of Quebec, Canada, July 26, 1843. His parents were Elijah S. and Arabella (Hibbardl) Tracy. They removed to Vermont from Canada in 1842. The Tracy family came originally from Tewksbury, England, to New England, as early as 1637, and Lieutenant Thomas Tracy was the first representative of the family in America. The greatgrandfather of Charles G. Tracy was Elijah Tracy, a soldier of the Revolutionary war, enlisting from Preston, Connecticut, came to Vermont in 1780, locating at Tunbridlge. When our subject was eighteen years of age he came to the United States and worked on a farm in New York, and later came to Wisconsin. In 1864 he enlisted in Company G, Second Illinois Light Artillery. His services were brief, but during the time he was engaged in the battle of Spanish Fort and Fort Blakely. After about one year of service he received his honorable discharge. In 1866 Mr. Tracy crossed the plains with a wagon train, starting from St. Cloud. For one year he tried his fortunes in the mines of Montana, and then went to Oregon, where he followed teaching and clerking in a store for another year. In 1872 Mr. Tracy came to Clay county, Minnesota, and began to work at carpentering in the village of Glyndon which at that time comprised three frame buildings and numerous tents. He continued at this work until 1881, when he purchased the hardware business of Hensil-wood & Nolan. He met with success in this department for six years, and then a destructive fire, which drove so many business men out of Glyndon, compelled our subject to retire from business. A year later, however, he again opened the hardware business, adding a stock of general merchandise, and since that time he has met with continued success, and now conducts a prosperous and increasing business. He is a man of unquestioned honor, and enjoys the esteem of a wide circle of friends and acquaintences. Mr. Tracy was married in 1875 to Mrs. A. T. Deming, nee Tucker. Of this marriage one son was born, Fred G., who now resides in Chicago. A stepdaughter, Miss Carrie Deming, completes the family circle. The latter was married to L. A. Huntoon, of Moorhead, Minnesota. Abram had an alias in civil war records as Abram Hacker. In some records he is Abraham. He was born 14 January 1842 in New York. He enlisted as a private on 16 June 1861 in the 82nd Regiment, New York Infantry, Company K. He was discharged on 24 June 1864 with indications he was wounded. He started drawing his pension on 18 January 1888, filed in Minnesota, then his widow, Anna, started receiving it on 9 November 1916 (filed in North Dakota). 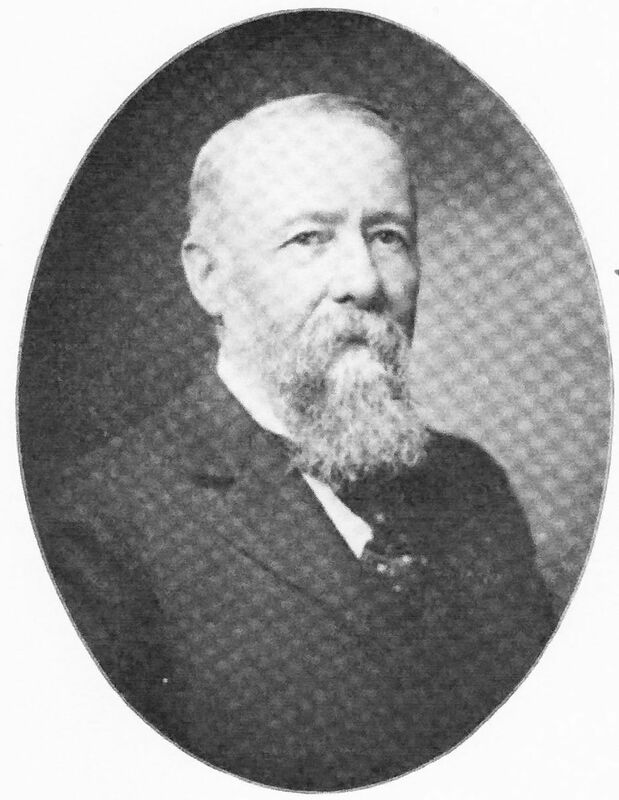 His family in both the Minnesota 1885 and the 1890 census reports indicate Glyndon as their residence. Abram died on 9 August 1916 in Preston, Franklin County, Idaho. Burial, Tombstone Picture. Harrison was born 28 April 1841 in Maine. He enlisted as a Private on 4 October 1861 in Company F, Maine 10th Infantry Regiment and mustered out on 7 May 1863. Then he enlisted again in Company F, Maine 29th Infantry Regiment on 13 November 1863. He was promoted to Full 1st Sergeant, then mustered out on 21 June 1866. For awhile he lived and practiced law in Barnesville. Harrison died on 27 August 1898 while visiting in New Jersey. His wife started receiving a widow's pension on 27 Febreuary 1897 in Minnesota. Research has been difficult to do on Furben. He did die before 1880 as his wife Torbjor, born about 1830 in Norway, was widowed in the 1880 (living with a son and daughter in Norway, Fillmore County) census and drawing a pension in 1883 and 1890. Torbjore is also in Norway, Fillmore County in 1900 living with a son. No records of his or her deaths has been found. Vesterheim, the National Norwegian-American Museum and Heritage Center's Civil War Database records this: "THRONDSON, TORBJOR: MN 4th Inf Co B. Civil War: Post war: In 1890, his widow, Torbjorg, was living in Bratsburg, Fillmore County, Minnesota. Sources: (1890 Veterans and Widows Census, Minnesota, No.123, roll 22)." Torbjor Throndson, is listed as a widow on the Clay County 1883 Pensioners List as living in Moorhead. The husbands name is not mentioned. This writer could not find Torbjorg on the 1890 Veterans Schedules. This writer believes that the Furben Tronson listed in Civil War records from Company B, 4th Minnesota Infantry is the husband to Torbjor (Torbjorg). Civil War records also indicate that an alternate spelling of his name could be Turben Torson. James was born in New York about 1833. He enlisted as a Private on 3 February 1862 in Company B, 2nd Wisconsin Regiment Cavalry. He was mustered out as a Corporal on 5 January 1865. He was a member of Grand Army of the Republic, Post 145 in Barnesville but lived in the area of Clay County in several places. He started drawing his pension on 26 June 1891. His wife was Chloe Anna Wheeler who started drawing a widows pension on 22 July 1911. They had children Charles Frederick, Ida F., and Minnie G. James died in Williston, North Dakota in 1902.